Curcumin is the main component of the Indian spice called turmeric. The compound is what gives turmeric its distinct yellow color. According to an article posted on the News Medical Life Sciences website, curcumin is obtained from the dried rhizome of the turmeric plant. The compound has been subject to much interest in the scientific community over the past few decades due to its many health benefits. Curcumin is best known for its potential in cancer management and prevention. A Self Hacked entry noted that curcumin helped inhibit the growth of new blood vessels in cancerous tumors and induce programmed cell death in various cancer cells. The compound is notably toxic against cancer cell mitochondria too. 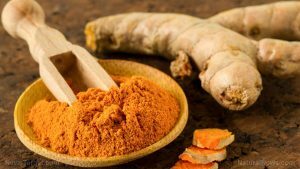 Curcumin is found to mitigate the regeneration of breast cancer stem cells and activate the nuclear vitamin D receptor to stimulate chemoprotective effects against colon cancer. Likewise, the compound is shown to inhibit the growth of prostate cancer and induce cell death in chronic lymphocytic leukemia. The essential nutrient is known to block tumor growth and pancreatic cancer metastasis too. In addition, curcumin also helps scavenge lung cancer cells and work synergistically with chemotherapy to address brain cancer. Aside from its cancer-fighting properties, the compound is shown to possess strong anti-inflammatory effects that relieve various conditions. Curcumin promotes cartilage regeneration and relieve chronic pain in people with joint problems. The nutrient is also found to work well with other medications in alleviating symptoms of rheumatoid arthritis and osteoarthritis. Curcumin is also touted for its beneficial effects on brain health. The essential nutrient is found to facilitate the production of new brain cells and reverse cognitive decline in patients with Alzheimer’s disease. The compound is shown to improve learning and spatial memory as well. Curcumin is also helps address brain hemorrhage and keep depression and anxiety at bay. In addition, curcumin is known to address a plethora of digestive system disorders such as stomach ulcers, and inflammatory bowel disease. The essential nutrients has also been traditionally used to regulate blood sugar levels and prevent the onset of diabetes. Likewise, the compound is touted for its capacity to induce healthy weight loss. The compound is valued for its cardiovascular benefits as well. Curcumin helps improve cardiovascular function and reduce the risk of developing various heart disorders. The important nutrient also possesses strong antioxidant and antibacterial properties that help stave off a host of infections. Curcumin is also touted to prevent cataract and promote overall eye health. Curcumin helps improve the body’s overall health and boost both the digestive and respiratory profiles. The compound is also beneficial to brain health and fortifies the bones, joints and the immune system. The nutrient supports the eyes, kidneys and the female reproductive health as well. Curcumin prevents the onset of various types of cancer. Curcumin keeps infections, kidney injuries, and Alzheimer’s disease at bay. Curcumin is particularly beneficial to the brain and the digestive system. Curcumin supports the body’s digestive and respiratory profiles. Curcumin maintain healthy bones, joints, and immune system.